The Tiger vs Phil Pay-Per-View match is the first of its kind. Generally, Pay-Per-View is reserved for wrestling and boxing but this time, golf fanatics can get their fix too. 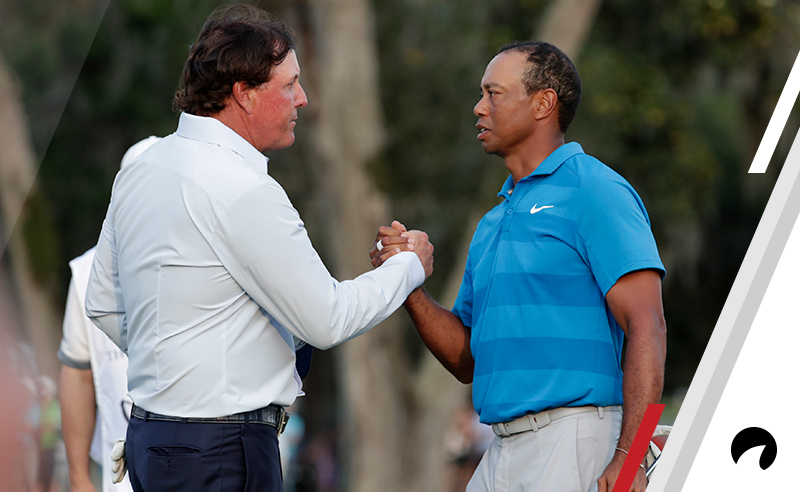 Tiger and Phil’s $10-Million Match combines the skills of two golf legends as they vie for ultimate golf supremacy and bragging rights. This golf matchup is one for the ages that bettors everywhere can take advantage of. We’ll show you where to bet on the match and help you understand how to read Tiger vs Phil odds so you can make smart wagers. The sportsbooks we champion are secure, trustworthy and industry leaders. To give you an idea of the best sportsbooks for your region, we’ve compiled a list based on geographic location. Where you live will determine which sportsbooks are available to you. Understanding odds can help you make educated wagers. For a more in-depth explanation of the Tiger vs Phil odds, check out our expert breakdown here. Who will win the $10-Million Match? Tiger is the favorite and Phil is the underdog. Favorites are always denoted by the minus sign (-) and underdogs are shown by the plus sign (+). Let’s say you have $300 to play with. If you believe that Tiger is going to win the match straight up, and he does, you would get a payout of $450. You would get your original $300 back, plus your winnings of $150. On the other hand, if you think Phil is an underdog with something to prove, you can bet on him instead. If Phil wins, that same $300 would net you a payout of $810. You would get back your original $300, plus your winnings of $510. You do not have to wager $300. You can wager whatever you want – or whatever your wife allows. Our Odds Calculator can help you determine how much you would win depending on how much you wager. In cases like this, there are no clear favorites which is why each color is listed with a plus sign (+) as if they were underdogs. If you believe that Tiger is going to wear a red shirt, as he has done in the past, you could place a bet on that color. Let’s say you finally took all those coins you’ve been saving since 1998 to the bank and came out with $224. A $224 bet on Tiger’s red shirt would get you a payout of $896. That’s a win of $674, plus you’re original $224. Again, you don’t have to bet $224. You can wager whatever you like but first check with the wife or whoever wears the purse in your family. Betting on Tiger vs Phil is fairly straightforward. You can simply pick who you think will win before the match or make side wagers on longest drive and closest-to-the pin. For a tutorial on how to bet on golf, check out OddsShark’s How to Bet on Golf page. We explain how to make a straight up bet, golf props and other wagers. We also cover golf betting strategies.